the fledging Port Canaveral in 1955. 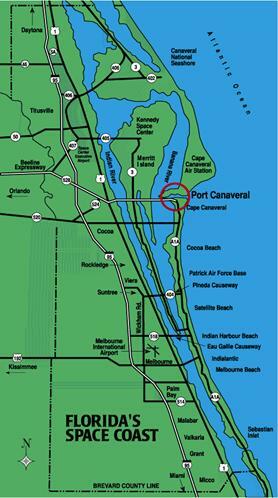 Since its dedication in 1953, Port Canaveral has evolved into a major deepwater port of entry with first-class berthing facilities, a thriving marine commercial park and foreign trade zone, and successful cruise and cargo industries. In coming years, tourism, the seafood industry, cargo ships, and the space race would drive business and growth to the port. Now one of the largest multi-day cruise port in the world, Port Canaveral proudly holds the distinction of being the first quadramodal port in the world, with links to sea, land, air and space transportation.